Explorers Tree, Katoomba. Well & Truly Past it’s Prime! | Sconquest. ← Medlow Bath, NSW. The Hydro Majestic Waits Patiently……..
An Explorers’ Tree in a Cage. What a great photo! Don’t you love those hats! By about 1900 the Tree was lopped. This photo from Blue Mountains Library Local Studies Collection says: First recorded use of the term Surveyors Tree; Star Photo Co (King St, Sydney 1899-1900). The top section of the tree was displayed in the grounds of the Hydro Majestic from 1906, the wall which probably killed the tree, was erected 1882 with this original plaque which shows only the last names of the explorers; a later replacement plaque included their first names. Here’s the new plaque and a new wire fence.This photo is from Wildwalks who show a short two hour bushwalk from Farnell Rd to the Explorers Tree and back. 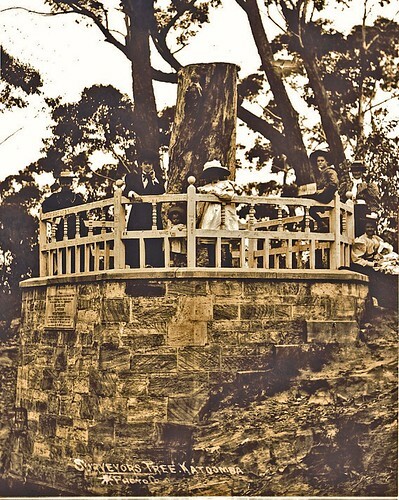 There’s so many sad looking pictures of the Explorer’s Tree at Katoomba on Trove at the National Library. In 1884, the wall & fence were erected by Hon. J. Farnell, Minister for Lands. Here’s what the Tree looks like today. Torturous isn’t it? Maybe it’s time to plant a new White Mountain Ash to commemorate this one marked by Blaxland, Lawson and Wentworth in 1813 as they looked for a route over the mountains. Why not 2013! If you have any old photos or postcards of the tree it would be great to add them to the story. At least the nearby Rosellas are happy. Now back to Trove to see what the newspapers say: Wow! The Town and Country Journal from 1884 shows an illustration for the proposed Six Foot Track and has what was actually marked on the tree and a possible reason for why it died. To be continued…….. (Drum roll). Get a bit carried away don’t I? Thought this was a simple story about a dead tree! This entry was posted in Attractions, Blue Mountains, New South Wales and tagged farnell, Katoomba. explorers tree, surveyors. Bookmark the permalink.